On my own weblog, Freespace, I’ve been urging readers to join me in helping the Victims of Communism Memorial Foundation. The Foundation needs another $23,000 in order to dedicate the monument in Washington D.C. this October. I thought I’d post a little here about one of the shocking atrocities that communism visited upon the world of biological science, in the person of Trofim Denisovich Lysenko. Lysenko was, simply put, a quack–a modern “geneticist” who rejected the very concept of a gene, and defended a neo-Lamarckian theory that acquired characteristics could be inherited. This nonsense became official party doctrine in the Soviet Union in the 1930s, in what historian Robert Conquest calls “the most extraordinary of all the indications of the intellectual degeneracy of the Party mind which had followed on Stalin’s replacement of the intellectual section of the apparatus by his own creatures.” Robert Conquest, The Great Terror: Stalin’s Purge of The Thirties 321-22 (1968). Id. at 171 (Anchor Books ed., 1971). Put in charge of Soviet genetics, Lysenko seriously hampered Soviet agriculture, and sent his scientific enemies to their deaths, including N.I. Vavilov, considered the greatest Soviet geneticist. Lysenko trumpeted that his “theories” clashed with Mendelian genetics. “[W]hen they ask what part of Mendelism to keep,”</b> he wrote, “I always answer: almost nothing.” His theories, he said, made up the only biology that Communists could believe in. “Under the action of external environment which is unsuitable or little suitable for a given species,” Lysenko wrote, “particles of a different species for which the conditions are more suitable arise in the body of the plant. From these particles, rudiments (buds or seeds) are formed which develop into individuals of the other species.” Quoted in Medvedev, supra at 172. Accordingly, Lysenko not only claimed that environmental factors could change one type of animal into another, he also denied that individuals within the same species even compete for resources. <blockquote>All mankind belongs to one biological species. Hence, bourgeois science had to invent intraspecific struggle. In nature, they say, within each species there is a cruel struggle for food…. The stronger, better-adapted indivudals are the victors. The same, then, occurs among people:: the capitalists have millions, the workers live in poverty, because the capitalists supposedly are more intelligent and more able because of their heredity. We Soviet people know well that the oppression of the workers, the dominance of the capitalist class…are all based on the laws of a rotting, moribund, bourgeois, capitalist society. Quoted in id. at 107. Other sciences were infected by Lysenkoism. Soviet physicists began declaring the theory of relativity, and the work of Bohr and Pauling to be reactionary and idealistic. Biologists repudiated the work of Pasteur, and a major prize was awarded to a Soviet biologist who claimed to have discovered spontaneous generation of single-celled creatures from soaked hay. Id. at 183. Soviet scientific journals were shut down. Soviet scientists opposing Lysenko were not allowed to speak at the 1958 International Congress of Genetics in Canada. “Since the time at which each paper was to be read appeared on the program, members of the Congress waited in silence until the time assigned for the undelivered papers expired.” Id. at 138. Biologists were dismissed from their posts, sent to prison, and worse; D.A. Sabinin, a famous plant physiologist, was fired from his teaching post, was hounded out of Moscow, and finally committed suicide. Id. at 127. Another geneticist was arrested because he visited his anti-Lysenkoite professor and brought him a bouquet of flowers. Id. 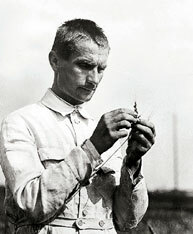 Lysenko insisted that his experiments on the transformation of wheat were a major discovery, and commanded that Ukranian wheat farmers implement the process. When another scientist reported no significant improvement in wheat yields, Lysenko responded with a threat: “Konstantinov must give thought to the fact that when such erroneous data were swept away from the field of scientific activity, those who failed to understand the implications of such data, and insisted on retaining them, were also swept away.” Id. at 155. Soviet agriculture was not the only victim of the Lysenkoite madness; Chinese farmers were ordered to implement his theories, with diastrous results. II. Why Did Stalin Put Lysenko in Power? Friedrich Engels, Ludwig Feuerbach (1927) quoted in V.I. Lenin, Marx, Engels, Marxism: A Collection of Articles 10 (International House, J. Fineberg, ed., 1935). Particulate inheritance seemed inconsistent with this for three reasons: first, it envisioned a stable, intractable category of things in nature, which could not be altered by conscious attempts: the gene making a pea wrinkled could not be transformed by direct action. This ran counter to the political progressivism underlying the Marxist program, which sought to reject all such unchangeable categorization. What Louis Menand says of American Progressives is equally true of their Hegelian cousins: they sought to “put an end to the idea that. . .beyond the mundane business of making our way as best we can in a world shot through with contingency, there exists some order, invisible to us, whose logic we transgress at our peril.” Louis Menand, The Metaphysical Club 439 (2002). I.I. Prezent, Lysenko’s partner in crime, put the point succinctly in a 1937 speech: “If hereditary changes occurred as portrayed by formalist geneticists, we should scarcely have had elephants descended from fossil forms. The whole point is that there can be metaphysical ideas about nature but there cannot be a metaphysical nature.”</b> (Quoted in Medvedev, supra at 31, emphasis added). Second, and relatedly, Mendelian genetics holds that environmental factors contribute to an organism’s evolution only marginally. Communist ideology, however, held that changes in the social environment would cause fundamental changes in the citizen: indeed, that there was no such thing as an individual personality outside of the environment: “it regarded ‘human beings’ [not] abstractly. . .[but] as a ‘synthesis’ of ‘all social relationships’ (definite, concretely-historical)–and thus. . .it was a question of ‘changing’ [the world], that is. . .of ‘practical revolutionary activity.’” Lenin, supra at 9. The consistency of Lysenko’s biological claims with the Communist party line is revealed in this 1940 article: “The materialist theory of the evolution of living nature,” he wrote,<blockquote>involves recognition of the necessity of hereditary transmission of individual characteristics acquired by the organism under the conditions of its life; it is unthinkable without recognition of the inheritance of acquired characters…. The representatives of reactionary biological science–Neo-Darwinians, Weismannists, or–which is the same–Mendelist-Morganists, uphold the so-called chromosome theory of heredity. . .. According to this theory, characters acquired by vegetable and animal organisms cannot be handed down, are not inherited. . .. They therefore hold that qualitative variations in the heredity (nature) of living bodies are entirely independent of the environment, of the conditions of life. . ..
A sharp controversy, which has divided biologists into two irreconcilable camps, has thus flared up over the old question: is it possible for features and characteristics acquired by vegetable and animal organisms in the course of their life to be inherited? In other words, whether qualitative variations of the nature of vegetable and animal organisms depend on the conditions of life which act upon the living body, upon the organism. The Michurin teaching, which is in essence materialist and dialectical, proves by facts that such dependence does exist. . .. We, the Michurinists, must squarely admit that we have hitherto proved unable to make the most of the splendid possibilities created in our country by the Party and the Government for the complete exposure of the Morganist metaphysics, which is in its entirety an importation from foreign reactionary biology hostile to us. . ..
Lysenko referred to this chapter of the History in a confrontation with Nikolay Vavilov in 1939. Vavilov had challenged Lysenko’s claim that by changing the environment one could change spring wheat into winter wheat and vice versa. (Lysenko’s claim, by the way, was backed by a single plant which he claimed had produced a single seed of winter wheat. See Medevedev, supra at 26.) Vavilov was a world-famous scientist who had organized over 100 trips around the world collecting plants to improve Russian agriculture. He was made president of the Lenin All-Union Academy of Agriculture, and received many prestigious awards, including a membership in the British Royal Society. Confronting Lysenko, Vavilov tried to explain in an almost panicked tone of astonishment that the gene was real, and that all the environmental factors in the world could not change one creature into another overnight. This, he said, was fundamental to the science–but Lysenko and his followers denounced non-Soviet geneticists as bourgeois and corrupted by capitalism. “[My] position is also that of contemporary world science, and was without doubt developed not by fascists, but by ordinary progressive toilers,” he protested at a 1939 conference. Id. at 59. “But,” a member of the audience shouted, “you proceed from the immutability of genes and the nature of plants!” Id. Vavilov pleaded that genetics wasn’t “conservative” as this audience member charged–that “[g]enetics is first of all a physiological science, and its basic problem is that of transforming organisms. That is what genetics is for. But in the course of investigations, it becomes clear that to alter hereditary nature is not that simple.” Id. But his pleas were ignored, and two months later he was brought before Lysenko and an unnamed ally to answer for his thoughtcrime. Medvedev provides some of the transcript of that meeting, which reveals the Orwellian horrors of doing science in Stalin’s and Lysenko’s Soviet Union:<blockquote>Vavilov:. . .You can imagine how difficult it is to guide graduate students, when all the time one is told that one does not share Lysenko’s views. History will indicate which one of us is right. . .. I am an overburdened man. . .. I should have explained this in greater detail. Of course species can originate on the periphery. If Trofim Denisovich would only listen calmly instead of shuffling pages–life goes on. . ..
Lysenko: You and I have talked calmly together in private; here it is different. This is the first time I have heard you say that species do originate. Apparently I misunderstood. But here [apparently pointing to a manuscript] it does say that evolution is oversimplification. Vavilov: Evolution is an oversimplification of specific events. This is a fact you could verify. Lysenko: I don’t question that evolution is fact. But is it true that evolution is an oversimplification, an unwinding? Is it true or not? Vavilov: It’s an indisputable fact. . .. There is a law of reduction; often many animal groups had a history of the reduction of many organs toward a vestigal state. There is also a law of increase in complexity. . ..
Lysenko: I understood from what you wrote that you came to agree with your teacher, Bateson, that evolution must be viewed as a process of simplification. Yet in Chapter 4 of the history of the party it says evolution is increase in complexity. . ..
[Unknown Inquisitor]: Marxism is the only science. Darwinism is only a part; the real theory of knowledge of the world was given by Marx, Engels, and Lenin. And when I hear discussion about Darwinism without mention of Marxism, it may seem, on the one side, that all is right, but on the other, it’s a horse of a different color. Vavilov: I studied Marx four or five times and am prepared to go on. . .. Quoted in Medvedev, supra at 63-64. J. Bronowski, The Disestablishment of Science, (1971) reprinted in A Sense of The Future</i> 241-44 (P. Ariotti and R. Bronowski, eds., 1977). Independence is essential to the pursuit of knowledge. The attempt to force science to conform with a political or social ideology–whether it be the Stalinist party line demanding the infinite malleability of creatures, or creationists demanding that biology conform to religious predispositions–is a disaster practically as well as philosophically. Please help honor the memories of those scientists who, like Nikolay Vavilov, went to the pyre. Please contribute to the Victims of Communism Memorial Foundation today.